As all Parishioners will know, there was an Open Weekend held in the Village Hall on 3rd & 4th November, where the South Stoke Housing Development working group of the Parish Council, the Diocese and Rectory Homes presented the current draft housing development plans for the proposed 25 homes to be built on the Glebe field. Some will not have been able to attend this and have not seen what was on display. For this reason copies of the seven displays shown by Rectory Homes, and the additional three displays SSHDP showed are available here. The intention of this Open Weekend was to allow those Parishioners who wish to do so, to comment on, or query these draft proposals. So, if you have not already completed an SSHDP Comment Form, and if you now want to, you will find blank forms available in the Shop or download here for you to complete. Please return it to the Shop from which we will collect it, or e-mail or post to our Clerk (clerk@southstoke.org.uk). Rectory Homes are also offering hard-copy and electronic forms of their own for you to complete, if you want to. Their hard-copy forms will also be found in the Village Shop, and their electronic forms can be found here. The document below contains the three SSHDP visual displays, which followed those presented by Rectory Homes, and which represented the history of the project - in draft layout form - from when Parishioners showed their preference for the 25 home option at the 2nd housing consultation in March and April 2017, to that presented by RH to-day. The newsletter article “The Glebe field past, present and future” from the November 2018 newsletter is here. The summary record of newsletter publicity - since early 2015 - by the SSHDP working group is here. 1st parish-wide SSHDP consultation, carried out in October 2015 - here. 2nd parish-wide SSHDP consultation, carried out in March & April 2017 - here. See below for the materials presented at that consultation. 1st SSHDP Housing Needs Survey carried out in August 2017 - here. 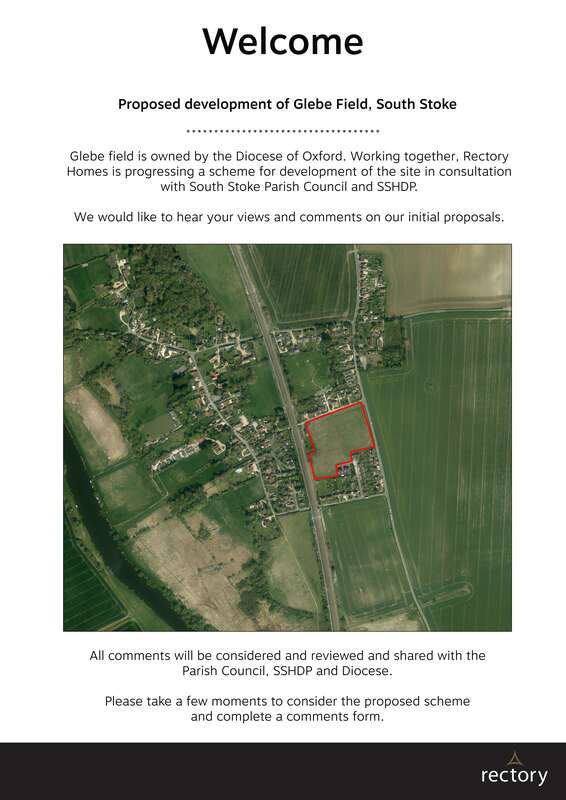 Following the first parishioner consultation in the Autumn of 2015, when the majority of villagers expressed enthusiasm for additional housing in the village, the Parish Council working group for this project has been working with land-owners and other relevant organisations to come up with some potential options. These were the subject of a second consultation, and the results of the exit poll formed support for recommendations that the working made to the Parish Council and the major land-owner concerned. To view or download a copy of the presentation charts used, please click here. If there are questions or comments, please contact Roy McMillan (roy.mcmillan@southstoke.org.uk) or the Clerk (clerk@southstoke.org.uk).